The new BMW 2 Series Gran Tourer is due in Ireland on June 6. BMW is describing it as the ‘first premium compact model to offer up to seven seats and fully meet the mobility requirements of young families’. Passenger and luggage priority is also flexible, with a sliding second row of seats and the third row folding into the floor. The new model can also accommodate five universal child seats. The new BMW 2 Series Gran Tourer will be offered with a choice of five turbocharged petrol and diesel engines. A four-wheel-drive variant will also be available, which BMW says, makes the 2 Series Gran Tourer the only seven seat 4WD in its class. The German car maker says the 1.5-litre 116hp BMW 216d Gran Tourer is the most efficient in its class. It has a top speed of 192kph and has a 0-100km acceleration time of 11.4seconds. CO2 emissions are 108g/km, meaning it attracts annual road tax of €190. The new model will be available in four trims – SE, Sport, Luxury and M Sport. Standard features include Intelligent Emergency Call, Bluetooth, electronic parking brake, auto lights and wipers, air conditioning and rear parking sensors. Options include panoramic sunroof, Head-Up Display and Traffic Jam Assistant. 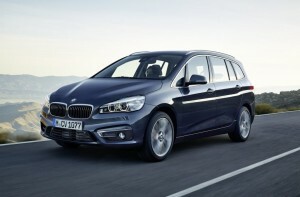 The BMW 2 Series Gran Tourer launches in Ireland on June 6, with prices starting from €35,940. Visit the BMW Ireland website or its Facebook page for further details.